A domestic farm located in the Agrocité, bend of micro-structure like beehive and chicken coop. The productions are integrate in the local distribution network throught the store local shop of the agrocité. AgroCité - unit of urban agriculture which consists of a micro-experimental farm, community gardens, composting and rainwater recycling, educational and cultural spaces, as well as devices for energy production. RecyLab - recycling and green building unit on Boulevard d’Achères. 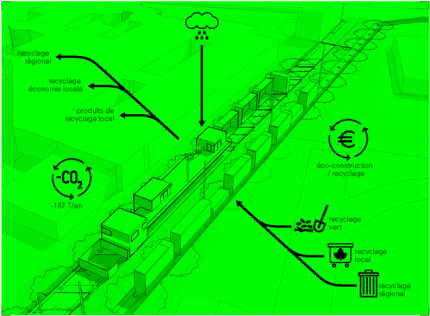 The unit is constructed around a series of equipment used for the recycling of urban waste and their subsequent transformation into materials for eco-construction. ECoHab - cooperative and ecological residential unit, located Rue Jean Jaques Rousseau. The unit consists of 7 experimental housing units, including social flats, researcher /student residence and community spaces which will be partially self-built. WOW is a mobile production unit which will operate in Hackney Wick (London, UK) and its surrounding area. This unit encourages collective production in situ, using local materials, resources and knowledge. It is a participatory project, which engages with inhabitants and local artisans to produce, reuse and repurpose. Achieve environmental improvements through eco-construction techniques (locally recycled materials, renewable energy, etc.) to develop a social, sustainable economy in Colombes. Initiate the spread of new urban, eco-friendly, practices such as reducing, repairing and reusing waste through educational activities and workshops. Reduce energy consumption for building operations on the entire project. fabrication workshops and assembly of elements for green building (vertical gardens, insulating panels, etc..). educational workshop sessions in DIY and for repair and reuse. The construction of RecycLab begins in 2012. Those interested in participating, please follow the News section or use Contact section on the homepage.